I am not a fan of "forwarded stories"....you know all those inspirational, pass it on to your friends kinds of things that arrive in your inbox WAY too often?!? Well my mom has always known that I NEVER read the things I am forwarded. Rather, I just delete them as soon as they arrive. Yes, I am sure I have missed out on some great stuff, but there is just not enough time in the day for all of it. And yesterday was no different. We have been agonizing about what to do now that Emmitt is no longer with us because Albert is so lonely for his companion. So we decided a few weeks ago to add a new kitten to our family. I have worried about if it is the right decision, but this "forwarded treat" from my mom gave me a little reassurance that we are definitely doing the right thing. 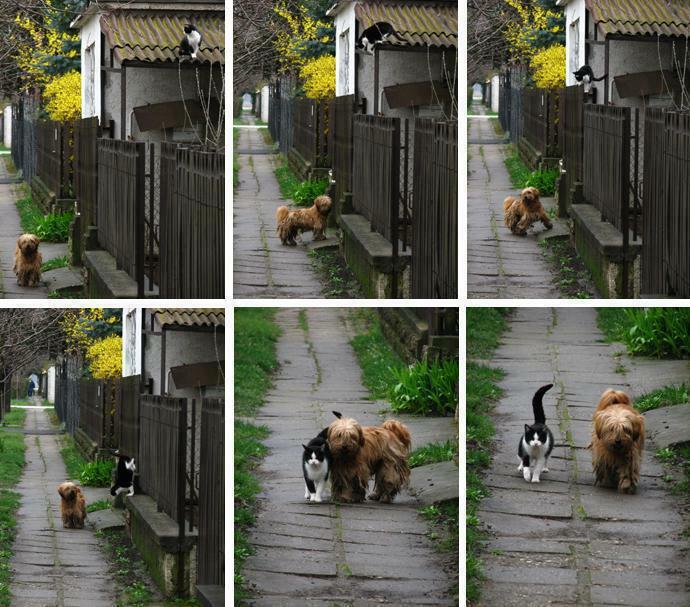 Every day - at the same time - she waits for him...He comes... And they go for a walk. Wouldn't it be great if we all had friends like this...no words needed...they just intuitively recognize the value of each other in their lives and act accordingly? Well our new kitten will arrive come home to us at the end of July... and I am quite certain that SHE will become Albert's very best friend....much like this pair above. I am really glad I opened this particular "FWD story". Thanks for sharing that story. We totally underestimate animals! Want to share an unusual story about my neighbors. They have a siamese-totally indoor cat. One day I saw Anthony carry "Lucy" up the stairs to their flat. He had a "plastic doggie bag" with him. Is this the first kitty who has her poop picked up? As usual, she was cradled in his arms with no desire to get down! Awww...where are you getting the kitty from? I remember seeing this on FB. So sweet. Can't wait to see your new kitten.